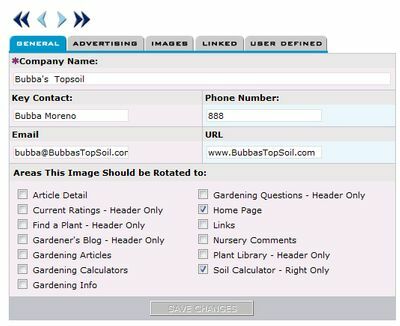 Add your advertiser's contact information and select the page(s) of the site where the ad should be displayed. On the ADVERTISING tab you indicate where the ad should be displayed and you can track the rates you're charging the advertiser. 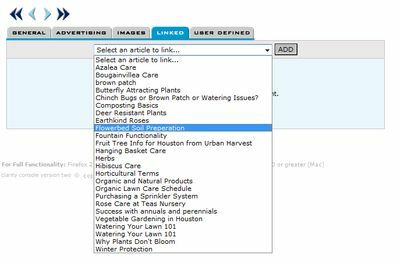 If you have licensed the Articles Editor, you can link advertising to one or more articles. Generate revenue by selling ad space on your website. You can quickly add advertisers to your site with the website Advertising Editor. We can modify your site to have ads displayed in the header, footer on the right or left hand side or just on specific pages. More specific targeted advertising is avaialble through the LINKED tab of the tool. You can have an ad display on one or more specific articles. For example, you may want to have an add for deer repelent linked to an article about deer resistant plants. On the ADVERTISING tab, you enter the start and stop date for the ad. 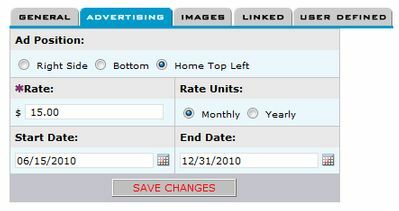 In this way, the ad will only display on your site during the dates the advertiser is paying for. You upload the ad image on the IMAGES tab and you can link the ad back to your advertiser's website or any URL they request.